Long overdue, made dinner for the Mah's! Getting the proper Spanish ingredients are tough and expensive to get in Singapore, it seems. Instead, I replaced a lot of ingredients, such as basmati for the paella (thanks to Mervyn for that idea). I completely forgot to take photos. I was a bit rushed on the whole thing since I had a late start. Luckily, Brandon Lee took some photos of the paella on his iPhone. Resulting Menu: ricotta cheese dip (not so Spanish, but I didn't have time for my manchego & jamon creation--it'll be for lunch tomorrow), prawn ceviche, seafood & chorizo paella, and roast chorizo & potatoes with thyme. Kimberly ended up taking over for dessert with a peach and strawberry crumble--thank goodness because she's a brilliant baker and I'm not. My original menu ended up not taking effect... another time, I guess! Everything turned out to be edible enough, considering it was my first home attempt at paella. I just wish I had a cast iron pan so I could get more of that nice thick bottom layer of crispy paella. 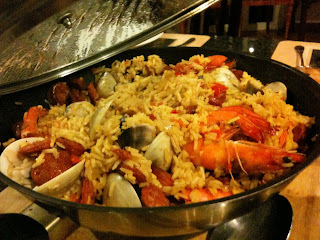 The main dish was inspired by Ruth Reichl's paella recipe with some personal twists. It was all gone by the end of the meal, so either it wasn't so bad or they were just starved by the time dinner was served. 1. Mix all ingredients (except prawns and wild rocket) and season with salt and pepper. 2. Pour marinade over the spot prawns and leave for 15 minutes (longer for scallops). 3. Serve marinated prawns with wild rocket and a final crack of salt and pepper. Hey Victoria, that paella looks yummy!! Chorizo is a sure bet for paellas, slurp! !